Nature Tours, Vultures, eagles and raptor birds photography. Hide photography from professional hides and low level angle. Full board trip for 4 days (3 nights) or 5 days (4 nights). Includes: accommodation, use of hides, local 4x4 transport, guiding, meals, transfer from/to airport. * We are flexible and If you want other dates or duration of your trip, contact us and we'll prepare a personalized quote (see section prices). 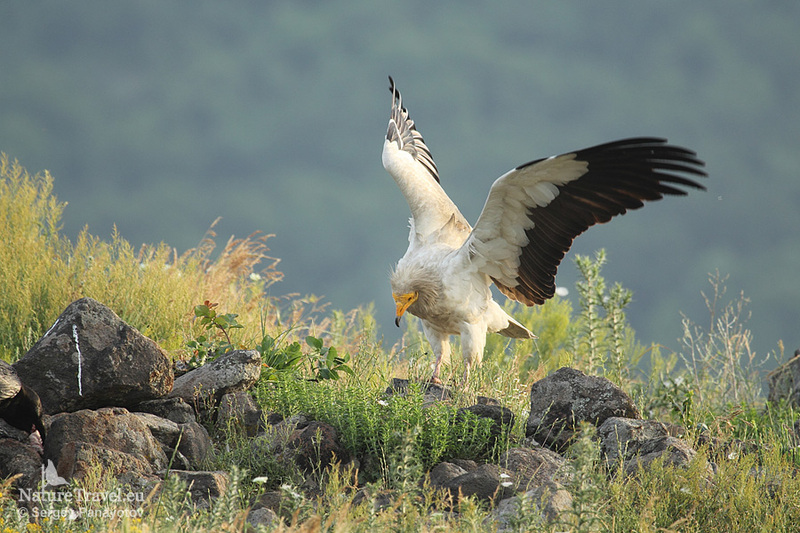 This tour is especially focused on raptor photography with griffon vultures and golden eagle. Winter is the most suitable season for eagle and vultures photography. It is hard to survive the winter and we regularly supply carcasses in front of the hide, so the raptors are common visitors at the feeding station. The view is incredible when more than 30 griffon vultures land in front of the hide. They are very active and there are often fights between hungry vultures. The landscape and background are perfect for flight shots. Shooting is through embrasures, the photographers can observe the area and what is happening in front through a small window above the embrasures. Visibility is very good and you can easily monitor incoming birds, which gives time for better reaction for the action shots. We manage two hides for raptors designed for 4 photographers. Every hide is equipped with a chemical toilet and heaters in the winter months. More photos from the Vulture hide. Day 1: Arrival in the area with hides near Madzarovo, Eastern Rhodope mountain. The transfer will take about 3-5 hours depending on the arrival airport. Best is to book flights to Bourgas airport, in this case the transfer time will be shorter. We can have a short walk, dinner and then brief instructions on how to photograph vultures and eagles, how to behave inside the hide and some tricks for better images. Day 2, 3: Еarly start, quick breakfast (optional breakfast in the hide) and drive to the hide (about 30 mins) - off road drive, quiet and quick settling in the hide. The experienced guide will help you if you have any questions during your stay inside. We will have packed lunches, hot drinks and water. Besides the vultures, other species that can be photographed are golden eagle, white-tailed eagle, wolf or red fox. This tour is organized together in partnership with the Bulgarian Society for Protection of Birds (BSPB – BirdLife Bulgaria) and part of the income is going to be used to directly support conservation activities. During our stay will be accommodated in the nature conservation center of Bulgarian Society for the Protection of Birds - Birdlife Bulgaria . This is a nice mountain hotel features comfortable and suite rooms, restaurant designed in traditional style where we can dinner traditional dishes and discuss photo session from the day. There is wireless internet. In hot days wen can also use the garden in front on it for relaxing.